Cryptokitties have gripped the nation. Well, some of the nation. Cryptokitties are digital cartoon cats that you can buy and sell using a cryptocurrency known as Ethereum. There's a real and active market for them, and they rise and fall in value, just like stocks or bonds. 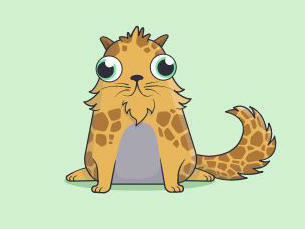 One cryptokitty recently sold for $140,000. And the company that creates these non-fungible felines recently landed a $12 million cash injection from venture capitalists. This may sound like so much internet kitty litter. But Hunter Horsley, who runs a company called Bitwise, says cryptokitties are exciting because they represent a new way of owning things. They might be the future! Whether they're a worthwhile investment ... is another question entirely. Do you ever get cornered at parties and have people ask you to explain the blockchain to them? HUNTER HORSLEY: Yeah. Yeah, absolutely. Yeah. Yeah. I love that. VANEK SMITH: Hunter Horsley is the CEO of Bitwise Asset Management, an investment fund for cryptocurrency. Have you had people coming to you asking you about CryptoKitties? HORSLEY: Yeah, it certainly comes up. I mean, you know, digital cats that people are breeding and buying for tens of thousands of dollars certainly gets people's attention. Yeah. No kidding. CryptoKitties made headlines earlier this year when one kitty sold for $140,000 at an art auction. And the company just got $12 million in funding. It has hundreds of thousands of players who've spent millions of dollars buying, selling and breeding - wait for it - digital cats. GARCIA: Yeah. And you can't do all that buying and selling in dollars because to buy a CryptoKitty, you have to use Ethereum, a cryptocurrency. This is THE INDICATOR from Planet Money. I'm Cardiff Garcia. GARCIA: Very ugly, actually, in some cases. Yeah. VANEK SMITH: ...Cute-ish little cryptofad, which also represents a brand-new kind of commodity. VANEK SMITH: Do you have a favorite CryptoKitty right now? WAYNE: Yeah. My Founder 32. GARCIA: This is Wayne (ph), or WittyKitty (ph), as he's known in the CryptoKitty universe. And Founder 32 is his prized CryptoKitty. VANEK SMITH: Are you looking at Founder 32 right now? WAYNE: Oh, I just put a smile on my face every time I look at it. That's what really got me into this whole CryptoKitties journey. Like, I just dove right in after I bought him. GARCIA: When he says he dove in, I mean, he's not messing around. VANEK SMITH: He went hard. GARCIA: Yeah. And he's talking about his most valuable CryptoKitty, Founder 32. And that's a high bar because he owns more than 5,000 of these cats. VANEK SMITH: Wayne first heard about CryptoKitties last year. He had started investing in cryptocurrency. And he got really excited about CryptoKitties for two reasons. First, it was something he could buy with his Ethereum, and he'd invested in this cryptocurrency Ethereum. But it can be kind of hard to buy stuff with cryptocurrency. And here was something you could buy only with Ether. GARCIA: But also, as Wayne was reading more, he came across an article about CryptoKitties that gave him an idea. WAYNE: The article talked about breeding, and it said the average costs for one breed was, like, $16, but the average kitty sold was $25. So to me, I thought that was a really good opportunity. VANEK SMITH: Wayne thought, I could have a little business inside the world of crypto breeding CryptoKitties. GARCIA: But Wayne wanted to be smart about this, so for a while, he just kind of watched. WAYNE: I kind of sat on the side. VANEK SMITH: You were, like, watching the prices of different kitties go up and down? WAYNE: Oh, yeah. I did that for three weeks straight. Like, even at school, I was watching it while I was in class. VANEK SMITH: Yeah. Did I forgot to mention Wayne was in college last year? And, Cardiff, I feel old. VANEK SMITH: We feel old. We feel old. GARCIA: But here is what young Wayne saw. Each CryptoKitty is a little drawing of a cat. The price ranged from less than a dollar to all the way up to thousands of dollars. And the key to a cat's value, he discerned, lay in certain attributes, or as the game calls it, cattributes (ph). VANEK SMITH: These are things like fur color, belly color, eye color, eye shape. VANEK SMITH: Wait. Non-fungible tokens? VANEK SMITH: That is what a CryptoKitty is? It's a non-fungible token? VANEK SMITH: OK. What does that mean? Non-fungible - so this means it is not interchangeable with something else like it. So a $10 bill, for instance, is fungible. It does not matter which $10 bill you have in the world. They're all the same. They all have the same value. GARCIA: Things that are not fungible - wine, paintings, cars, property, or in the case of CryptoKitties, a drawing of a particular cat. Or actually, if we're being really precise, the little bit of code that represents a particular cat and how it looks. Like, for example, Founder 32. WAYNE: Oh, yeah. He - I mean, it took me a lot of willpower to click the button to buy it. But once I moved the Ethereum over, I was like - you know what? - I'm committed, and I know what I'm doing. GARCIA: Founder 32, the $10,000 cat. GARCIA: Wayne said he had faith for a few reasons that Founder 32 would keep its value. One is that Founder 32 was one of the first CryptoKitties ever made. It was a Generation 0 cat, or Gen 0. There's a limited supply of these Gen 0 cats, and so Wayne thought Founder 32 would hold its value. VANEK SMITH: Also, because he was so old, Founder 32 had some really special, valuable cattributes, things like orange fur and something Wayne calls crazy eyes. WAYNE: So its eyes are actually facing different ways. WAYNE: And it has a beard, which is only existent in, I believe, 25 kitties in the entire game. VANEK SMITH: So a beard is, like, very desirable? VANEK SMITH: Wayne started breeding Founder 32 with other cats and selling the offspring. And his initial $10,000 investment in Founder 32 - he says it's paid off. VANEK SMITH: You've made $115,000 on CryptoKitties - like, selling your CryptoKitties? WAYNE: I actually haven't cashed out, so I actually still - I still believe in the game, so I've been reinvesting all of it except what I need to live. GARCIA: But Wayne, he's a believer. So for him, yeah, it's a game. He loves playing it. He loves the cats. But it's also an investment. WAYNE: I think Gen 0s, yes. GARCIA: Yeah. Hunter Horsley, CEO of Bitwise, is skeptical. HORSLEY: I don't know. I don't know about that. I think it's a little bit like buying a Beanie Baby or a piece of your friend's artwork. VANEK SMITH: I know. I know. VANEK SMITH: ...Really risky. But he says there is something really exciting and really groundbreaking about the CryptoKitties themselves because this is an entirely new way to own something. So in the past, you could buy something within a digital space. Let's say you buy a high elven sword inside of "World Of Warcraft." You can run around inside the game and use your high elven sword, but it's not like you can take that sword with you. Like, you can't take it into "Mario Kart." But the way CryptoKitties works, you would own the high elven sword. It would be a unique sword with a unique little bit of code underlying it, and that would be yours. It would be all yours, and you could take it anywhere. You could sell it on eBay. You could bring it into another game. It represents an entirely new kind of property. GARCIA: Hunter says this could have huge implications. So we know, for example, that things like our emails or online documents and photos are all really valuable to us, and they feel like they belong to us. But actually, we don't own them. And it's really hard to price all that stuff. There's never been a way, for example, to price an individual email or a photo. HORSLEY: We haven't had a good way historically to represent that value. What non-fungible tokens represent is the ability to put a price on every specific unit. GARCIA: So Hunter says that a lot of people are seeing major potential in non-fungible tokens. Earlier this week, for example, Major League Baseball launched Crypto Baseball cards, and, of course, you can only buy them with Ethereum. A few marketplaces have even cropped up where people can sell these non-fungible tokens. VANEK SMITH: In the meantime, Wayne is still making money selling his CryptoKitties. But his investment has lost a lot of its value. Ethereum has been dropping against the dollar all summer. So remember the $10,000 Wayne paid for Founder 32? That same amount of Ether would be worth about $3,000 today, which probably means the great Founder 32 isn't worth nearly what he was when Wayne first locked crazy eyes with him last year. VANEK SMITH: A brave new world of commodities - buy them, breed them, sell them. We could not resist. Tomorrow, join us. THE INDICATOR buys a CryptoKitty. Oh, my God. GARCIA: What fresh hell is this? GARCIA: Our money's gone. It's gone. VANEK SMITH: It's not gone. Maybe we should say, tomorrow, THE INDICATOR tries to buy a CryptoKitty, right? GARCIA: Yeah. Yeah. We're not good at this. (SOUNDBITE OF DROP ELECTRIC SONG, "WAKING UP TO THE FIRE") Transcript provided by NPR, Copyright NPR.